A wind turbine on the Danish coast near Thyborøn is a world-first: its conventional generator, with permanent magnets, has been replaced with a version containing superconductors. This new turbine weights only half as much, is more compact and nevertheless capable of generating the same amount of power. 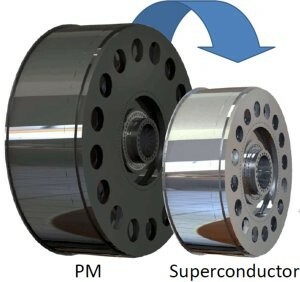 The superconductors replace the big and heavy magnets of a conventional wind turbine. Just as in the traditional bicycle dynamo, magnets rotate inside coils that convert the mechanical energy into electrical energy. Powerful magnets can be manufactured using coils of superconducting cable: these are lighter and use a much smaller amount of rare-earth materials such as neodymium. The lighter turbine has the additional advantage that the tower construction can also be made lighter while the smaller size makes transport along the road less complex (although this has to be done only once for each turbine). Superconductors conduct current without resistance. This allows for high currents and strong magnetic fields. They do, however, have to be cooled to a very low temperature. The magnets in the new rotor are build from superconducting tape: on a flexible steel carrier is attached a thin layer of superconducting material that carries the current. This tape, which initially could only be manufactured at laboratory scale, can now be made by the kilometre. A pair of compact cryocoolers rotate with the rotor and provide a temperature of –240 °C. The University of Twente was involved in everything that is cold in this project: the testing of the tapes and magnet coils, finding the optimal cooling and the assembly of the rotor in its entirety. After two years of testing in the lab, everything came together towards the end of the summer of 2018: the generator with a diameter of four metres – nearly one and a half metres smaller than a conventional version – was, after ground tests at the Fraunhofer Institut für Windenergie und Energiesysteme in Bremerhaven, transported to Thyborøn. There it was installed in a GC1-type turbine manufactured by Envision: this type can generate 3.6 MW and has two rotor blades with a total diameter of 128 metres.